Our staff and invited guests introduce their favourite documents from the Bristol Archives collections. For this edition, Allie Dillon, our Senior Archivist, has selected marriage records of England’s greatest crime writer. 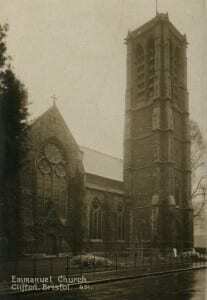 The wedding took place at Emmanuel Church on Guthrie Road, Clifton. The church was close to Clifton College, where Archie’s stepfather was a schoolmaster. 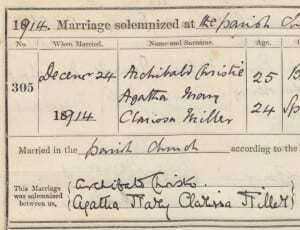 Archie is described in the church’s marriage register as a member of the Royal Flying Corps and Agatha as a spinster. Aged 24, she was just beginning her writing career and not yet a published novelist. Agatha met the young pilot at a dance in October 1912 and they became engaged in 1913, just before he entered military training. At the outbreak of the First World War, Archie was sent to France. 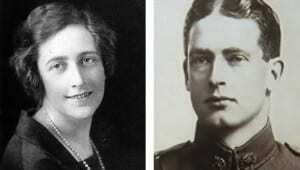 During his first period of leave, Archie and Agatha met in London on 23 December 1914. It was a tense reunion: with Archie’s future uncertain, Agatha was keen to marry but he refused. They travelled on to Bristol and later that evening, Archie suddenly decided that he and Agatha should be married the next day. They spent the morning of Christmas Eve trying to quickly obtain a marriage licence. Finally, on the basis of Archie’s part-time residence in Clifton, they acquired a licence for the sum of £8. The affidavit signed by Archie Christie that day can also be found at Bristol Archives, in the archive of the Diocese of Bristol. The wedding was arranged so quickly that Agatha wore her ordinary clothes. Outside the church, she had a chance encounter with an old acquaintance, Yvonne Bush. Agatha wrote in her autobiography that she asked Yvonne to be ‘an impromptu bridesmaid’ and a witness to the wedding. The register shows, however, that the marriage was witnessed by Archie’s stepfather, William Hemsley, and another man. The bride signed her name as Agatha Mary Clarissa Miller, presumably for the final time. After the wedding, the Christies spent Christmas in Agatha’s home town of Torquay. A day later, Archie returned to France and the couple were parted until he was next granted leave the following summer. Archie served in the Royal Flying Corps throughout the war, eventually becoming a colonel. Agatha stayed in Torquay, where she had joined the Voluntary Aid Detachment to nurse wounded soldiers. Later in the war, she became a qualified dispenser and learned about the poisons that she later used to murder many of her fictional victims. When the war ended, the Christies settled in London. Their marriage lasted until 1926, when Archibald asked for a divorce so that he could marry his mistress. This was the catalyst for Agatha’s very public disappearance in December that year and the couple divorced in 1928. The reference number for the marriage register of Emmanuel Church (1869-1950) is P.EC/R/2/a and the reference number for the marriage licence is EP/J/3/2.